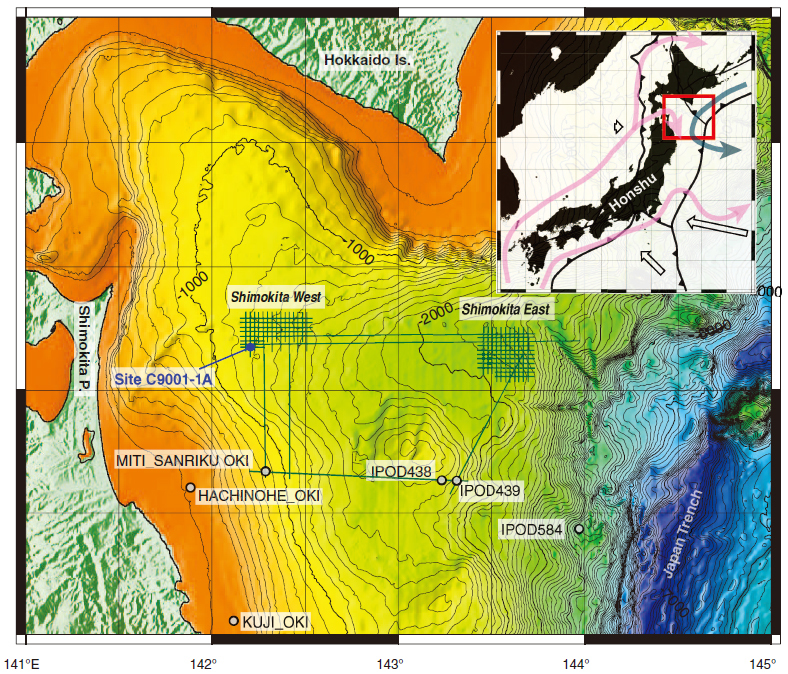 CDEX currently plans to implement IODP Expedition 337: Deep coalbed biosphere off Shimokita, starting in 15th March, 2011. The expedition will focus on microbial and biogeochemical processes, as well as basic studies on geobiological aspects and physical properties, in and around the Eocene coalbed at ~2000 mbsf. Complementary project proposal is a scientifically motivated expedition having a commitment from a third party source of at least 70% funding for the platform operating costs of the expedition. This expedition will be funded by Japan Society for the Promotion of Science (JSPS), as a part of the Strategic Fund for Strengthening Leading-edge Research and Development to JAMSTEC (PI: F. Inagaki). The expedition will follow the normal IODP rules for designation of co-chief scientists, scientific staffing, and the IODP Sample, Data and Obligations Policy that defines data moratorium, data access and publication responsibilities. The objective of this expedition is to deepen a hole and recover core samples down to the target Eocene lignite coalbed. The core samples will be used to investigate geological, geophysical, (bio-)geochemical and (geo-)microbiological features of the formation, with a view to expand our knowledge on coalbed subseafloor hydrocarbon system and the deep biosphere. Particular focus will be made on deep subseafloor life and the biosphere down to 2200 mbsf, in a habitat that has never been reached by previous scientific ocean drilling. We will investigate active microbial communities and geobiological processes in the thermally immature coalbed at great burial depths. 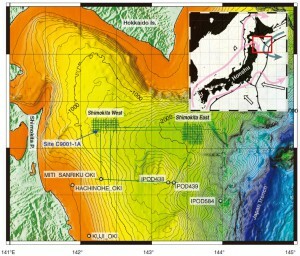 The proposed site has already been drilled in part during the Chikyu shakedown cruise CK06-06 in 2006: the hole C9001D was cased to a depth of 511 mbsf. As the initial step of the riser drilling down to the coalbed, we will first re-enter and deepen the hole by riser drilling to reach at 1220 mbsf. Spot coring will be conducted at selected intervals, and 13-3/8” casing will be installed to that depth after the first series of wireline logging runs. Then, the riser drilling will continue with spot coring through Oligocene marine sediments and Eocene terrigenous/lacustrine sediments to the depth of 2200 mbsf. Second series of wireline logging will be performed before casing and suspending the riser hole. For the better recovery of high priority target material, we will switch the coring system from the standard RCB coring to industry-type large diameter coring system, equipped with special device of either full closure core catcher or jam-prevention mechanism. The large diameter (10 cm) coring system uses 27 m long core barrel retrieved by a pipe trip. Three runs of the large diameter coring are planned at two intervals; one for regional unconformity found at about 1700 mbsf, including marine-terrestrial sedimentary interfaces, and the other two for Eocene coalbed and porous sandy layers. Wireline logging program includes standard set of resistivity, density, porosity, formation image, and zero-offset VSP experiment, as well as in-situ geophysical and geochemical measurements (e.g., pH, pCO2, hydrocarbons) and sampling of pristine formation fluids from permeable layers. In addition to riser drilling, a separate hole will be drilled for pressure core sampling (PCS). 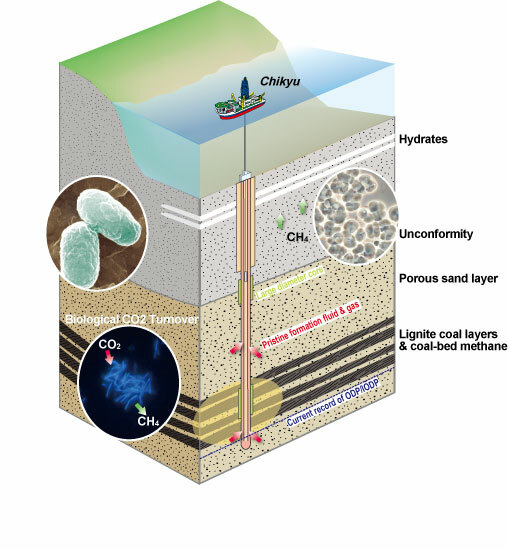 PCS will be attempted at intervals in 200-300 mbsf, retrieving possible methane hydrate-bearing sediments at the site. Current plan is that the expedition starts on 15th March, and ends on 21st May. This would allow 68 days of offshore operation. Since the first week is spent for preparation of riser drilling without producing any scientific data, Science Party will get onboard Chikyu via helicopter on around 20th March, and will disembark on 21st May at the port of Hachinohe. This schedule is still subject to change. Update and latest information will be available at CDEX website (http://www.jamstec.go.jp/Chikyu/eng/). We will organize a full science party to conduct a standard core analysis flow. By the start of this expedition, new radioisotope lab will be installed to conduct onboard radioisotope experiments. In addition to core samples, cuttings and gas samples will be continuously collected from circulating drilling mud. Mud-gas logging will be conducted by using a newly installed gas monitoring system. Contamination test by chemical tracer in drilling mud will also be attempted. To complete these onboard analyses, we will organize science party including co-chiefs scientists, sedimentologists, organic and inorganic geochemists (including mud gas monitoring), microbiologists, physical property specialists, micropaleontologists, logging scientists and other specialists such as hydrocarbon reservoir rock specialists. (1) All expedition schedules are subject to change based on FY budgetary situation and site conditions.